With our start date fast approaching (4 days away!) I’ve been spending copious amounts of time getting my gear in order. Everything has been weighed down to the ounce, put into a spreadsheet, and carefully considered in relation to advice from friends, blogs I’ve read, and countless hours of YouTube videos I’ve watched. Next I take the gear weighed in ounces and pack it all in my backpack, then I weigh the entire set to see what I have in pounds. What!? 24 pounds dry weight! My goal was 18 pounds! (Dry Weight: The weight of my backpack and everything that will go in it every day, not including my food and water) After looking at the scale, then at my pack, then watching another YouTube video of a guy doing the same thing that I am, I take everything back out, look it all over again, reconsider a few items, put them aside, and start re-packing. As I re-pack I reassess the items I decided to leave out…that fleece sweater is only 8 ounces, and it’s really warm…I should probably take it just in case. You know, those Crocs are 15 ounces, they are goofy but they would be great camp shoes…I better take them too. And so it goes on and 30 minutes later I have the bag packed and ready to weigh. 24.5 pounds! How did it get heavier!? You can see how the ounces and pounds are running my life…so what am I measuring in pints? Well, after doing this hopeless routine for a few hours I finally stop caring about ounces and pounds and instead focus intensely on a pint of beer. Success! My gear list…be on the lookout, in the next day or so I will post my gear list of everything I’ll be taking on the trail with me. I’m waiting because as mentioned above, that list seems to be changing more often than the front runner in this year’s Republican Primary. Logistically what do the next few days look like? Ryan Simko is arriving in Santa Barbara late tonight. Monday and Tuesday will probably be an exact mirror of the story above, except that we’ll have two of everything. We might even throw a third set into the rotation and get Brian Sarvis in on the action, but he seems a lot more secure in his gear selections. Wednesday morning, March 7th, Amy will drive the three of us to Los Angeles. We are taking a 7:30 AM direct flight from LA to Atlanta. After landing in Atlanta around 2:30 PM, Ryan’s friend Rob will be there to pick us up and drive us to the trail. We may take a quick detour through downtown Atlanta for one more look at a big city and some creature comforts like a burger and a beer, but then we’re off to the woods. The plan is to arrive at the Amicalola Falls State Park before dark to set up camp. 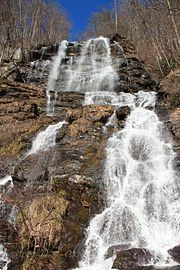 Side Note: Did you know that the Amicalola waterfalls are considered to be one of the Seven Natural Wonders of Georgia? Better question, did you even know that Georgia has Seven Natural Wonders? Anyways, back to the plan. The morning of March 8th we will wake up, eat breakfast, break camp, and start on the Appalachian Trail! Well, not actually. From the camp ground in the state park there is an eight-mile trail that will lead us up Springer Mountain to the actual start of the Appalachian Trail, called the southern terminus. Since we are only planning to hike 10 miles a day for the first few days to let our bodies adjust to the trail we may be camping that night at the Springer Mountain Shelter, or more likely at the Stover Creek Shelter, a mere 2.8 miles down the trail. When all is said and done we’ll have a good day’s hike under our belts, and only 2,181 miles left on 2,184 mile trek. Not bad! Thanks for following my blog! If you want email updates when I create a new post you can type your email address in the “FOLLOW BLOG BY EMAIL” box in the top right corner of this page. You then get an email with a link that you need to click to confirm the registration. Once that is done any time I post something you will get an email that day or the next alerting you to the new content. Enjoy! Check out Backpacking Light if you haven’t already. This month’s Backpacking magazine is the big gear roundup.